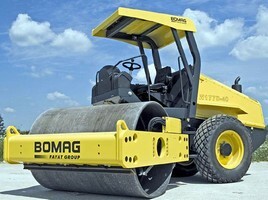 LAS VEGAS - Better access to service points and improved operator ergonomics top the list of improvements to BOMAG's redesigned BW177-40 Series single-drum vibratory rollers. The new roller series includes three models: the BW177D-40 and BW177DH-40 smooth drum rollers and the BW177PDH-40 padfoot roller. All three offer a 66-inch working widths and are powered by Tier III compliant Cummins diesel engines. The BW177D-40 and BW177DH-40 are designed for compaction of granular and mixed soils, while the BW177PDH-40 is designed for cohesive and semi-cohesive soils. All three are ideal for a variety of site preparation applications, including highway construction and maintenance, residential and commercial construction, parking lots, driveways and landfills. The new rollers feature an easy-to-operate, vertically-opening engine hood that provides full access to the engine, hydraulics and cooling system. The multi-section design allows individual panels to be replaced if damaged. Engine cooling air is exhausted upward from the rear of the hood to reduce dust on the jobsite. The vibration-isolated operator's station has been enhanced with an ergonomically repositioned steering wheel and a new integrated instrument cluster that alerts operators to potential problems with engine oil pressure, engine coolant temperature, hydraulic oil filter restriction, engine air filter restriction, brake control and electrical charge control. Reduced stop-to-stop steering input makes steering easier and more comfortable and the line of sight has been improved to the rear of each model, ensuring better all-around visibility. Available options include a swivel seat, heated and air conditioned cab, work lights, leveling blade (BW177DH-40 and BW177PDH-40 only) and smooth and padfoot shell kits. Standard dual amplitude and vibration frequency allow the BW177-40 Series rollers to be customized for different jobsite requirements. All three models deliver frequencies of 1,800 and 2,400 vibrations per minute, while each generates 30,375 pounds of centrifugal force in high amplitude and 27,000 pounds in low amplitude. Anti-Slip Control (ASC) systems on the BW177DH-40 and BW177PDH-40 models monitor slip potential between the drum and rear tires to maximize traction and gradeability. As a result, the BW177DH-40 and BW177PDH-40 offer maximum gradeability of 55 percent with and without vibration. In addition, all three models feature a no-spin differential on rear axles for improved traction. The drum exciter system is virtually maintenance-free while a centralized electrical panel permits systematic and efficient troubleshooting. The bolt-on design of the oscillating/articulating center joint simplifies replacement. Drum vibration buffers can be replaced individually without the need for special tools.